The good news is feeling an instant chemistry with the handsome man sitting next to you in a waiting room. The bad news is that the waiting room is in a hospital and both of you are oncology patients with uncertain futures. Such is the premise of author Paulette Mahurin’s compelling and bittersweet new novel, “His Name Was Ben.” The storyline strikes a particularly poignant chord with me these days as one of my dearest friends is currently going through her second bout with cancer. “I can get through all the chemo, the nausea, the fatigue, and wearing wigs,” she told me the first time, “if it means I’ll be done with all of it by this time next year.” Unfortunately, such was not the case. “I completely trust my doctors,” she said a few weeks ago, “but frankly this whole chemo thing is really getting old.” Mahurin’s likable protagonist, Sara, aptly captures the angst of a beautiful and accomplished woman who is as stressed about dying as she is about living, specifically if “living” not only involves dealing with a cruelly dysfunctional family but also an understandable reluctance to actively re-enter the dating pool if it means revealing to prospective dates that her body is no longer “whole.” For women who are still single or divorced, a double mastectomy is a death sentence in and of itself, especially if having breasts is equated with society’s definition of sexuality and desirability. Yes, that handsome man in the waiting room was exciting enough for Sara to surreptitiously note his name and phone number but can she muster the courage to actually call him and introduce herself? It’s her best friend, Ellen, who pushes Sara to take a chance, for certainly Fate has put “Ben” in Sara’s orbit for a reason. Ben, however, is as wary of romantic encounters as Sara. When their first “date” channels “An Affair To Remember” and Sara fails to show up, it’s little wonder that Ben assumes he has been set up for some kind of sick joke and that his caller was never serious. The fragile relationship that starts to unfold will have readers reaching for Kleenex on more than one occasion. Mahurin’s expertise as a nurse practitioner makes every scene resonate with accuracy, as does her knowledge of Southern California and the Central Coast which serve as the backdrop for the story. And what book isn’t made all the better with the presence of a dog – Taz – who teaches the bipeds a thing or two about unconditional love and the joys of living in the moment instead of apologizing for the past or fearing for the future. (Profits from Mahurin’s books go to help rescue dogs.) The story is also not without villains in the form of Sara and Ben’s respective family members who are themselves among the walking wounded that can only react to life’s disappointments with vitriolic anger, self-loathing, and accusations that loved ones were obviously predisposed to contract diseases because of things they did – or didn’t – do. A first-rate read from a first-rate author whose wordsmithing I admire and whose passion for storytelling comes deeply from the heart and soul. An extremely brave subject to tackle, but done with dignity, compassion and style. This book is so well-observed that it is impossible not to be able to relate to it on so many different levels even without having experienced the terrifying subject matter itself.The story centres around two people who are facing the unthinkable and whisks you away on an emotional roller-coaster which will have you laughing and crying but most importantly routing for the pair who show us what life is really all about. This book and author really deserves some serious attention and I so hope that it receives it. In the mean time, I can’t recommend it highly enough. Read it! – and it will stay in your heart for a very long time. Mahurin’s talent is her ability to be realistic and not pull any punches without getting lost in the drama and drowning the reader. When a couple spend the short time they have together trying to tackle the beginning of love and the end of life, at the same time, sometimes in the same day, it can seem surreal. It would be easy to overwhelm the reader with pain and sorrow instead of showing them that real people still live real lives under horrendous circumstances.There’s little I can add to the details since the other lengthy reviews cover so many aspects of the book. It’s really necessary to leave some surprises for the reader. The key word in some of the other reviews is fictionalized. This work is based on a true story, which makes it all the more poignant. If you ever wanted to really walk in someone else’s shoes, Mahurin does an excellent job of taking her readers on that journey. Cancer tears down many things when it ravages lives, but for this couple love speaks loudest. For them, the risks are worth the challenges because there are no guarantees of another chance to do even the mundane things of daily life. They don’t have the luxury of avoiding facing their mortality. They can’t live in denial for years either. They have a choice, live today, in the present, or miss what may be the last chance to live fully. Most importantly, they love enough to let go and respect the other person’s wishes. There’s a wonderful lesson in there for all of us who will inevitably face final decisions with loved ones, regardless of the cause. At my request, Ms. Mahurin provided a copy to me to review. I read and reviewed her other book and when I saw this book, I asked to read and review it. I have to say her work always surpasses my highest hopes and still improves. I’m looking forward to reading more by Mahurin. I loved how the two main characters met though it was probably for the worst reasons. There’s probably a lot better places to meet someone special than at an oncologists office though Sara and Ben are perfect for one another. They both come from dysfunctional families and have managed to make the best of it through the years. Cancer is a very insidious disease and it instantly brings up fearful images for most. I don’t know how to describe it otherwise and it’s central to the story line. In many places I wanted to cry. Stage four breast cancer has Sara Phillips planning an exit strategy from life when an experimental drug protocol pulls her back from the brink of death. As she grabs onto the thread of hope and struggles with her damaged self image, a chance encounter in the oncologist’s waiting room brings her in touch with a handsome stranger who rekindles the woman in Sara she thought was gone. Sara peeks at his new-patient form, learns the man’s name is Ben, and memorizes his phone number. Newly diagnosed with pancreatic cancer, Ben is told his life may end in a few months. In the face of death and against all odds, the two fall in love and grab on to life.”His Name Was Ben” is author Paulette Mahurin’s fictionalized account of the story of two real people who faced the reality of cancer and chose to live in love, no matter how much time they had. Together, they face the demons of their dysfunctional families and gain peace of mind.This poignant story offers readers the opportunity to experience the roller coaster of emotions surrounding cancer, to see how love can replace despair and how caring for someone else can help ease one’s own pain.”His Name Was Ben” is relevant for anyone who has faced a life-threatening illness, while carrying an important message of love and hope for all readers. I read Ms. Mahurin’s first book, The Persecution of Mildred Dunlap, giving it a 5 star review, highly impressed with her grasp of character under duress. His Name Was Ben goes farther and deeper, dealing with the often terrifying concept of personal mortality, the extinction of life, while still trying to live with both positive and negative relationships, memories and the detritus of everyday living. Add to that, the very poweful desire to live each moment better and create something new, powerful, loving and lasting while the Grim Reaper is constantly in the foreground, these make for great writing on Ms. Mahurin’s part.I won’t go into the storyline, as that has been stated elsewhere in these reviews. But her handling of the characters’ relationships with parents, siblings and friends, is especially poignant and very real. She draws us in, making us feel and understand what the two protagonists are going through, but also revealing the good and bad parts of the background players, each of whom contributes much to the story.As with her first book, this one cries out for a good film script! This isn’t my usual genre that I read but I was gripped from the first chapter. I was rooting for Sara from the start. Such a well written and honest work! I was gripped and as the tale unfolded I couldn’t stop. The romantic in me really wished and wished for what would be a happy ending and I feel the way in which the author told the story left me satisfied, yet emotionally drained. It’s rare to find a story that you are so invested and that’s so well and sensitively written that can make someone connect and feel such emotion. I felt like I was with Sara and Ben every step of the way, experiencing all the ups and downs that the circumstances brought. What else can I say but wow! Ben, a forty year old man, loses his battle with cancer. During the last year of life, he meets Sara, a cancer patient and woman of his dreams. Uncertainty of time drives their appreciation of every precious minute. The author accomplishes two major tasks: describing the ugliness of cancer, while writing a beautiful story of human emotion. Ben and Sara fight their disease with extraordinary courage. Friends and family issues come to the surface, resembling real life. His Name was Ben by Paulette Mahurin is a book for all ages. Covering the hard knocks of life and the importance of compassionate relations create for a satisfying read about an unpleasant topic. This entry was posted in AMAZON, AMAZON RANKING, HIS NAME WAS BEN, REVIEWS FOR HIS NAME WAS BEN. Bookmark the permalink. 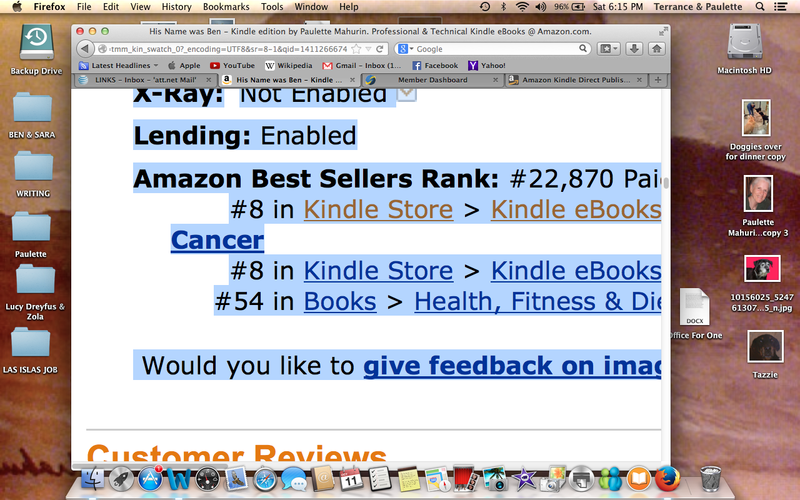 His Name Was Ben #8 in the Amazon Book Store Kindle best seller list for its category. I am in awe of your ability to publish books! I have the content, don’t know where to start. Superb…! What a great feeling you must be experiencing moving up the popular chart so fast. Congrats – such good news. It’s amazing what you do for the doggies.